Magic brings people together. This is a community that knows no bounds. Age, race, language, religion, profession, education are suspended here. They don’t exist. 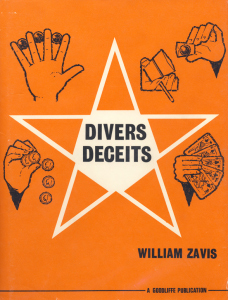 I remember Bill Zavis, a sophisticated American diplomat who worked at the U.S. Consulate here in Montreal for several years, who not only was interested in Magic but won the 3rd prize at FISM for Micromagic in 1973 and was author of the magic book Divers Deceits. He came into our shop shortly after he moved to Montreal and another magician was there who he did not know and in no time they deep in an animated conversation. There was instant rapport, understanding and eagerness, despite the obvious differences in language, education and social standing. 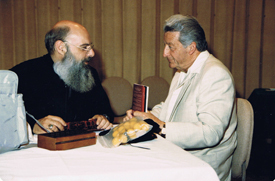 Bill Zavis had a creative and intelligent approach to magic. To me he was an exceptional person. I’m easy to get along with. Ask Phil. I like people in general. I have all the patience in the world. But there was this one kid, and I love kids, who I couldn’t take. Maybe he was 13 years old. There was just something about him. I treated him with respect but was glad when he left. 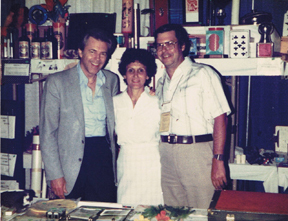 Bill often came to the magic shop on his day off to help us behind the counter, just as a friend. We were friends with Bill and his wife and we had daughters the same age so it was great. When this kid came in Bill used to spend a great deal of time with him, talking to him and explaining things to him. 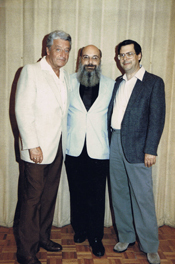 One day I said to him, “Bill, how come you spend so much time with him. I hate to say this but I don’t see how you can stand him.” Obnoxious might be an appropriate word here. And Bill simply answered, “I know he isn’t pleasant, but the kid is lost and maybe his interest in magic is the one thing that will save him!” How did that make me feel? It gave me a different outlook on life and magic after that. When looking up Bill’s link, (see above) I realized that we produced an effect he invented called Soft Center. He created other effects as well. He was brilliant and died much too young. We miss him. is one of the many started that way. He was serious about it and made a successful career out of it. 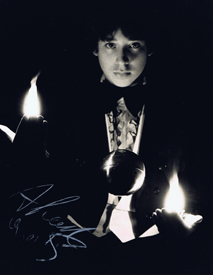 Alan was 8 years old when he first became interested in magic. He was home with the Chicken Pox and saw Tony Curtis in the movie Houdini on TV and that was it for him. 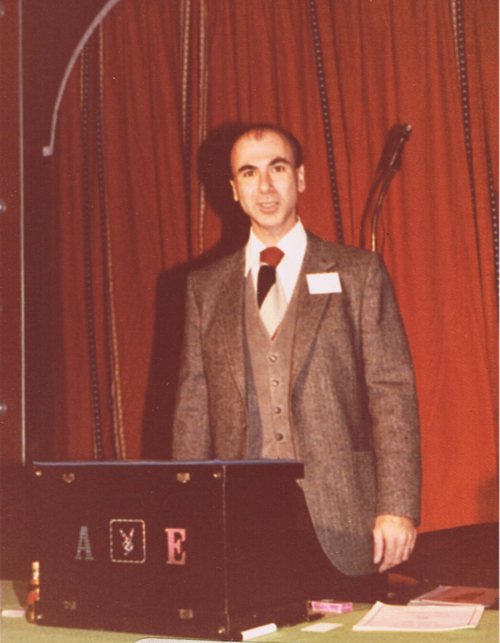 He got magic books at the library and bought a bag of magic tricks at Henry Gordon’s on Queen Mary Road in Montreal (before Perfect Magic was born) for a dollar which was a lot of money then for him, but he was on his way. He started getting paid for shows when he was 14 years old and his parents drove him to his gigs and back. 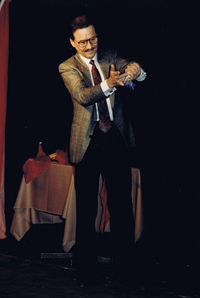 He’s been teaching magic in elementary schools since 1984; he does corporate shows, parties, weddings, bar mitzvahs, fundraisers, etc. If you’re just starting in magic and you are serious, there are a few things I would recommend. One would be Complete Course in Magic. It’s a book by Mark Wilson. 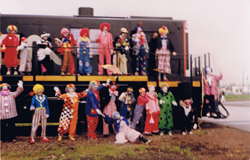 It covers just about everything from close-up to stage illusions. Being a book, there is no personality to the tricks. You have to find your own personality and put your own twist on everything. You’re not copying someone’s style or jokes…you have to be creative and you have to be yourself. You are unique and if you just tap into your own personality it will come through and you’ll make the trick yours. 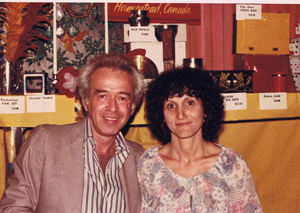 Harry Lorayne with Evy Matlin - late 70's. I don’t have anything against DVD’s. They’re wonderful teaching tools, but its tempting to just copy the performer, word for word, action for action. The name of the game is Entertainment First George Schindler did a DVD on this and it can’t be stressed enough. 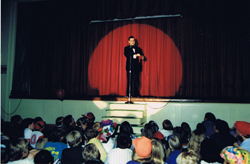 You can be the best sleight of hand magician in the world but if it’s not entertaining, forget it! It takes time and effort to put an act together. For an idea of what is involved Scripting Magic by Pete McCabe and 26 other guys is a good start. Foundations: The Art of Staging Magic by Eberhard Riese is another one. 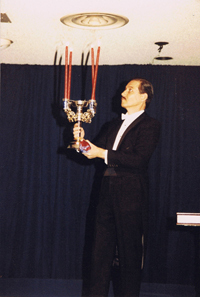 Eugene Burger’s Mastering The Art of Magic is marvelous! Eugene lectured for Perfect Magic a few times and the advice he gave was excellent, not only for magic but for many real life situations where you have to deal with people. It’s hard to do magic for people! When you’re alone, it works perfectly; in front of an audience, not always. What do you do when things go wrong? How do you choose volunteers? What do you say to them? They may give you answers you’re not expecting. How do you handle it? Fortunately, others who are successful are willing to share their secrets and ideas. They are your teachers so take advantage of their knowledge. Take the plunge. Just make sure there’s water in the pool. It’s safer that way. Which books or DVD’s made an impact on you or helped you get started? We’d love your comments. The first time magicians come to Perfect Magic shop they usually ask Phil if he is a performer. He says yes, I’m a ragtime and nostalgia piano player. And he is. He even has two CDs out, Ragtime Magic and Ragtime Daze. But everyone wants to know if he does magic. He’ll deny it, but he did, when he was younger. If someone wants a magician now, we usually refer them to some of our customers. Here are some photos of Phil to prove my point. 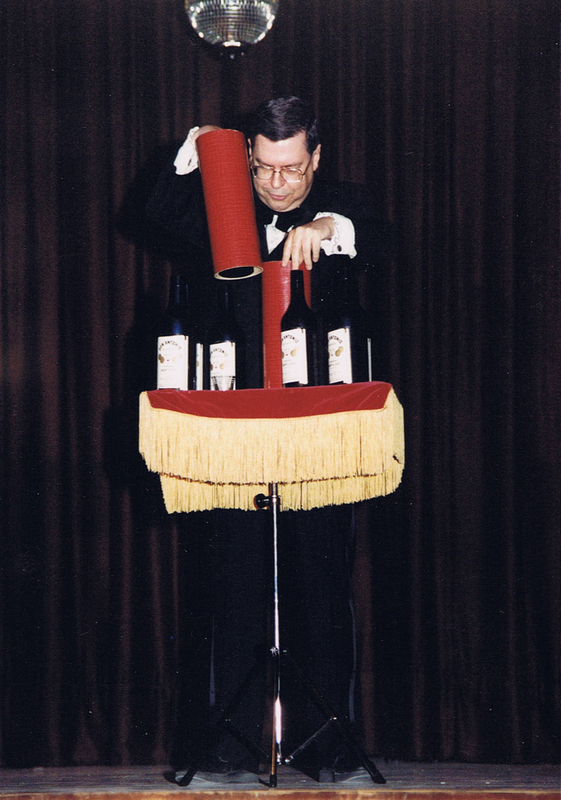 He always finished his stage show with Multiplying Bottles. That was always an audience pleaser. You can see that it goes back a few years so I don’t remember the whole routine, but it looks like he tied it in with This . He loves the Pom Poms. 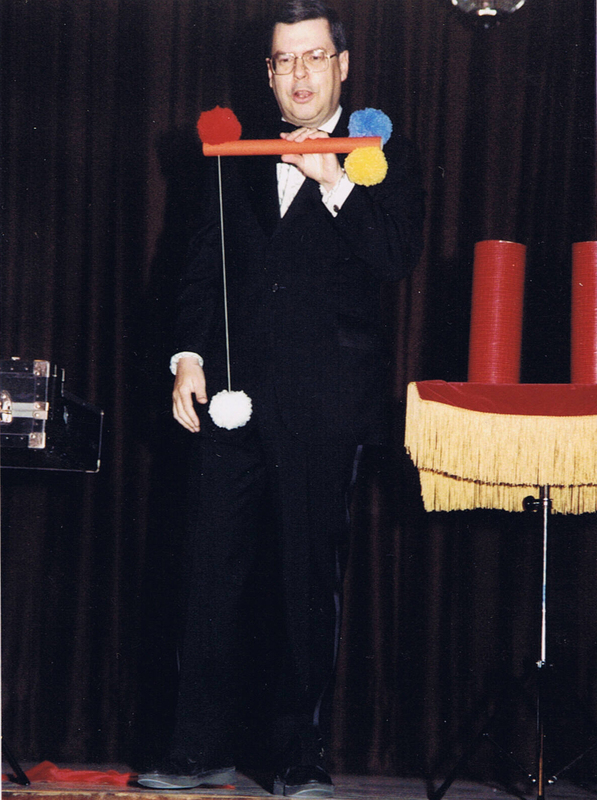 Phil also has an hour and a half Vaudeville show with Romaine, called Back In Time featuring magic, music, comedy, and ventriloquism. Top from left to right. 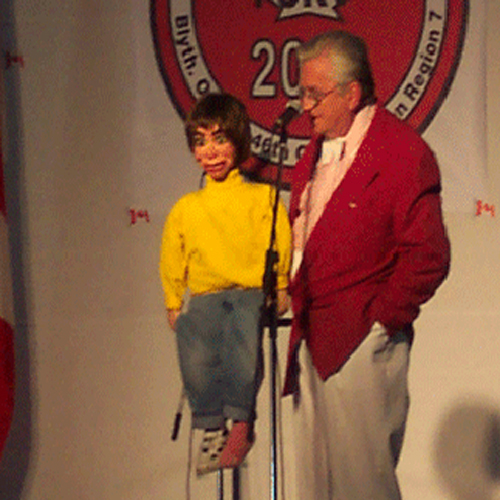 Photos 1 -5 are from the Gala show at a Clowns Canada show in Moncton New Brunswick. 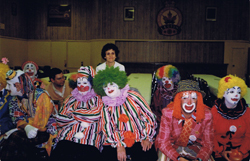 Photo #6 Was a show at Courtland Park School For The Montreal assembly of the SAM, produced by Blair Marshall and photos 7 & 8 are from a Campvention show in Blythe Ontario. Over 1000 people attended this show. Phil also did close up. Here he is performing The Endless Chain. and he has an excellent routine for it in his lecture notes, (yes, he used to lecture as well) and of course his routine is in the instructions. He did card tricks too. Bewildered and Future Foretold Improved also in his lecture notes are ones he always did. Grandmas and Grandpas and Magic Part 1. It’s sometimes hard to connect with kids these days. They’re into video games, DVD’s and other new age stuff. It’s also hard to compete with Spider Man and Dora.What you need is magic! What age is a good age to start? I started my grandson at 2 ½. He was thrilled with Appearing Flower and knew just when to say tadah! 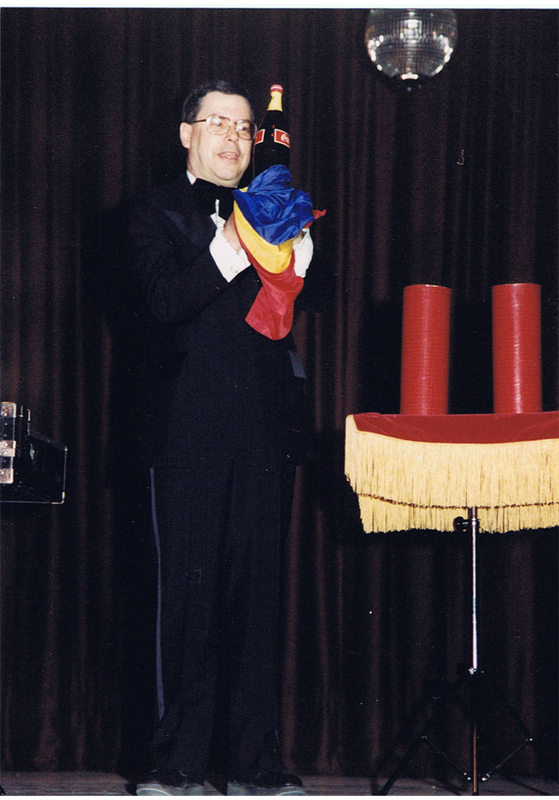 George Schindler, the dean of the Society of American Magicians, was so impressed with his performance he sent him a Appearing Bouquet as a gift! He’s 4 ½ now and his eyes still light up every time he sees a magic trick! He performed one for Show and Tell at day care. He told me he showed but he didn’t tell. My first memory of a grandparent bringing his grandson to the magic shop goes back about 30 years. The boy was about 11 years old, I think, and his grandfather said, “The boy is shy. Do something for him!” It was an order and a plea. I showed him a trick and his face lit up. His grandfather bought him a couple of things. And just where is he today? Richard Sanders He is a professional magician par excellence and creator of some of the greatest magic effects to hit the market. Go to his home page and click on about us to get his full credentials. He blames me for getting him into this, as I blew him away with the Mental Photo Deck and he claims that’s what did it. I blame his grandfather. 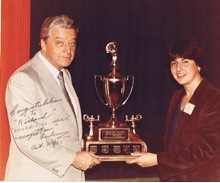 Photo of Richard Sanders receiving the Tom Auburn Award from Tom Auburn in 1981 at Magie Montreal. One of the highlights of our Magie Montreal convention was Sunday evening after it was all over. We did our share of going to out of town conventions as magic dealers and we found that Sunday night was always a let down, as you would be alone in your suite in a strange city after the high of the convention. You were exhausted from packing and there was not much to do. To combat this, after every convention we used to invite all the magic dealers and performers from out of town to our home for supper and to chew the fat so to speak. We ordered platters from the Brown Derby, a famous deli, no longer in existence, in the Van Horne Shopping Center, corner Victoria. We miss it as it was half a block form our shop. It was great fun. 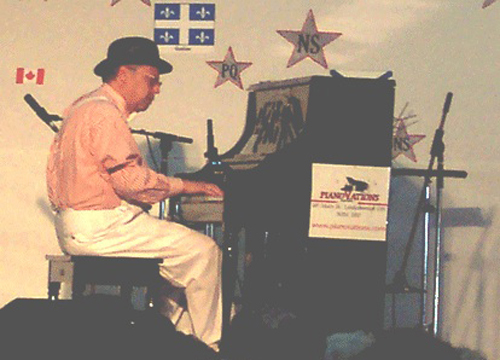 Usually Phil played piano and everyone sang, danced, ate and joked around. I remembered one cold rainy Sunday after one of our conventions all the dealers and performers were at our house. We always announced that there was one rule. No smoking in the house. At that time we lived in an upstairs duplex. Who ever wanted to smoke put on their coats and stood on the balcony and smoked. I still laugh just thinking about it.